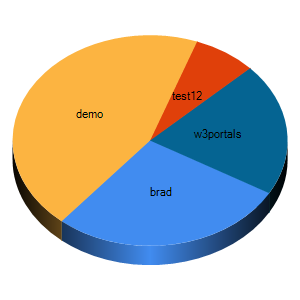 As Scott Guthrie explained on his blog, how to get this new slick asp:chart control. I figured I'd post a simple code example. I basically have an Orders table that I want to count the number of orders for each vendor to create the above super snazzy Pie Chart...IN 3-D!!!! Assuming you have installed the mschart.exe, the assembly references should get automatically added to your web.config when u drag the control to a aspx page.